Hi Nicole! I found your blog through the blogging your way class. I was flipping through homework assignments and I noticed we had a lot of blogs in common that we read, so I thought I'd pop over and say hi! 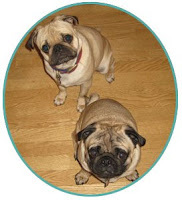 :) Your pugs are completely adorable, btw. I was flipping through your posts -- have you had a chance to start up a biz? It's my goal to start up something by the end of the year (!) and would love to hear if you have and how it's going.